The System Profiler, as a type of software analyzer, helps you look at the timing of activities after the interrupt has been acknowledged by the OS. To accurately measure the time between signal generation and acknowledgment, you need additional hardware tools. To measure interrupt service time—the time for the OS to acknowledge the interrupt, handle it, and return to normal processing, you must log the QNX Neutrino Interrupt Entry/Exit events. If you're interested in the time from the OS's acknowledgment to when an ISR runs, you need to capture the Interrupt Handler Entry/Exit events in the log file also. 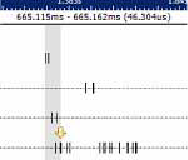 To properly gauge the latency in triggering a response in user code, you should log the QNX Neutrino READY and RUNNING thread states, in addition to the communication PULSE events, since these are often used to trigger a user application's interrupt response. Interrupt activity is best viewed in the System Profiler editor using the Timeline pane. To do so, open the log file, and in the editor, switch to the Timeline pane via the menu item System Profiler > Display > Switch Pane > Timeline, or the editor's dropdown menu for switching panes ( ). This display shows the various event owners or sources, which include interrupts, interrupt handlers, processes, and threads, as a tree with their associated events arranged horizontally on their own timelines. Here, you can see that the io-pkt process has attached to Interrupt 0x8c and that procnto-600-instr has attached to Interrupt 0x800000000, which on this system is the timer interrupt firing once every millisecond or so. The displayed table provides a breakdown for all event sources, showing the number of raw events and the average, maximum, minimum, and total duration of the various thread states over the log period. Next, uncheck the Show statistics for all elements box at the bottom of the General Statistics view. The tables in this view will show the statistics related to just the selected event owners. You can navigate directly to the timeline markers for events with maximum and minimum times, where you can look at the exact timing sequences. To do this, select one of these entries in the States table, then right-click and choose Go to max duration or Go to min duration, or use the equivalent toolbar buttons, to jump directly to the selected event. At this level of granularity, it also helps to see the Trace Event Log view concurrently with the Timeline pane. This view is part of the default QNX System Profiler perspective, and you can also access it using Window > Show View > Other… > Trace Event Log. The Trace Event Log view and the Timeline pane are synchronized; when you move your cursor in the editor area, the selection in the view also changes. So the total interrupt handling time from start to end of the OS's ISR, including the event-handler, was 11.304 microseconds. If you look at just the time for the interrupt-handler attached by the io-pkt process, you can see that it's only 8 microseconds. The time for the user-level interrupt-handler to be scheduled rather than the time for it to start running. This is signified by a transition of a thread in the receiving process (io-pkt) into either the READY or RUNNING state (e.g., event 13516 in the table screenshot above). This time may differ greatly from the actual start of the processing time in systems with many processes of mixed priorities. The time between the end of a specific interrupt-handler's execution and the awareness by the user-level process (either the scheduling or the start of processing) of the interrupt occurrence. This timing can be quite relevant when there are multiple ISRs sharing the interrupt, which may skew the time before the user-level interrupt-handler starts running.